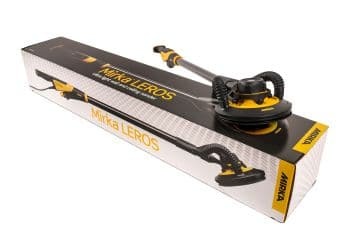 Win a Mirka LEROS, the lightest sander in its class. The first wall sander with a 180° flexible sanding head, an orbit movement and dual suction points. Years of development work and a determined focus on ergonomics and user-friendliness have resulted in the lightest brushless electric wall and ceiling sander on the market, Mirka® LEROS. This unique tool has features like no other comparable sander on the market. The flexible sanding head enables the tool to easily follow the operator’s movements and permits the operator to use an ergonomic working position. The flexible head also helps the operator to reach the surface from different angles. 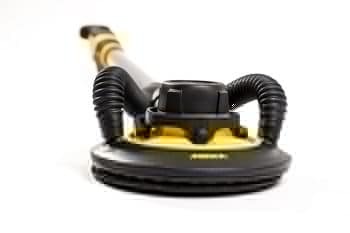 Mirka® LEROS is the lightest wall and ceiling sander on the market. Thanks to the light weight, the operator can sand for longer periods and less strain is put on the operator’s body. The random orbital movement enables an easy handling of the tool and a better finish. Hence, there are fewer interruptions due to fatigue and less re-work is needed. Due to the lack of springs and brushes there is no need to press the tool against the wall when sanding with Mirka® LEROS. Instead the complete force is transferred to the sanding process. The brushless motor reduces the weight of the tool significantly. In addition, less maintenance is needed since there are no carbon brushes that need to be changed. To enable efficient dust-free sanding the shroud has two suctions points and a pad that is optimised for Abranet® sanding discs. The operator saves time and money and the work environment is cleaner and healthier. Competition closing date: 23.59pm on the 30th April. Entrants must be aged 18 years or over and must be employed/self-employed within the Painting and Decorating industry. You must be a UK resident to enter. Entries to the competition can be gained by completing and submitting the competition entry form on www.trade-decorator.co.uk website. Only one entry per person. The prize is as described on the Trade Decorator competition page and will be mailed out to the winner/s directly from the manufacturer. The competition is open from the 1st April 2019 until 11.59pm on the 30th April 2019. A prizewinner/s will be picked at random. Determined by the number of prizes. Please ensure that you put a valid email address on the entry form. The winners will be contacted by email. If a winner does not respond to the email within 48 hours, the prize will be redrawn. The prizewinner must be prepared to take part in all publicity related to the promotion. The prizewinner’s name and company (including the caption and images) may appear on the Trade Decorator Facebook, Twitter & Instagram pages and on the www.trade-decorator.co.uk website. By entering the competition you agree for Trade Decorator and its selected partners to contact you with newsletters and/or future product offers that Trade Decorator believes may interest you. If you would prefer not to receive these offers you will be given the opportunity to unsubscribe on every email that Trade Decorator sends to you. The results of the competition are final and no correspondence will be entered into. Prizes are non-transferable. By entering the competition, users agree to be bound by these terms and conditions. Fantastic prize, I’ve just completed a spraying training course. The quality of the finish means that the prep has to be perfect. One of these would go a long way to help that. Good luck all and again well done for offering a great prize. Want one so bad.. guy on my own,and lose few jobs because im not dustlist on my sanding, what im using is not strong enough… Can’t afford one right now, trying to save, but kids band mortgage.🤯 Also be nice to get break or a nice foot up from someone.. I take a lot of pride in my work, to the point sometimes I lose out.. but customer is over the moon.. can’t beat that..